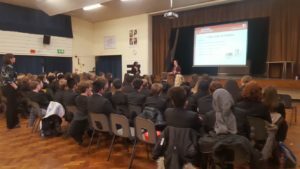 The Modern Languages department would like to thank the University of Leeds to give our Year 9 and Year 12 students the opportunity to attend a talk this week as part of the “Leeds Loves Languages” project. It was a very enjoyable experience for our linguists raising awareness on the benefits of learning a language as well as how languages can be beneficial for future career and employability. Did you know that 80% of the world does not speak English?